View current and past issues of our quarterly and weekly newsletters by selecting from the lists below. You must have Adobe Reader in order to display the Quarterly newsletter properly in your browser. If you don't already have Adobe Reader, you can download and automatically install it now. 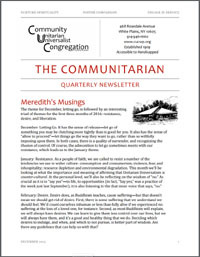 Weekly newsletters are displayed online using the Constant Contact link for each edition. The latest four editions are listed below.